The California Mid-State Fair in Paso Robles kicks-off its annual celebration of the SLO County wine industry this month with a professionally judged competition and a grandstand concert. On July 16, the Fair will host its Wine Industry Awards Party, the culmination of the 2009 California Mid-State Fair Central Coast Wine Competition held on June 16. According to organizers, "The Central Coast Wine Competition is the largest wine evaluation event that recognizes wines produced exclusively from vinifera grown on the Central Coast regions of California." 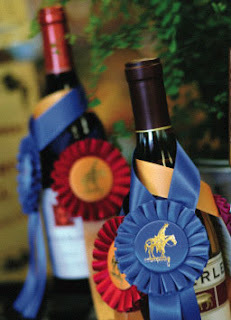 In 2003, the California Mid-State Fair presented its first-ever commercial wine competition, the Golden Spur Syrah Challenge, with fifty-three wineries submitting over seventy wines for judging. Today the competition has evolved to represent over 600 entries. Wines will be considered for Gold, Silver and Bronze medals in their respective classes as well as “Best of Class”, Best White & Red and “Best of Show.” “Best of Class” awards will be awarded to one wine from among the gold medal winners in each category. Best of Show is awarded to one wine recognized to possess special characteristics of the highest quality overall. To offer a venue for California Central Coast wines to be professionally judged. Provide information to wine consumers about the quality and style of wines that are currently being produced in the Central Coast area. Help with the exposure of unknown or unrecognized wineries to the wine consumer (over 380,000 visitors attend the California Mid-State Fair). Encourage competition between winemakers to improve quality practices throughout the wine regions of the Central Coast. Expand the general knowledge and awareness of accomplished wineries in the Central Coast regions. Provide an opportunity for the California Mid-State Fair to recognize the presence of the wine industry as an integral agricultural component of the community. The Judging Panels for the 2009 California Mid-State Fair Central Coast Wine Competition will be comprised of wine professionals representing a variety of fields within the wine industry. The Wine Industry Awards Party will take place at the SLO Agriculture & Wine Plaza, in the Mid-State Fairgrounds. The celebration continues on Friday, July 31 with An Evening of Music & Wine at the California Mid-State Fair, featuring platinum-selling artist, humanitarian, entrepreneur, radio host, and instrumental music advocate Dave Koz performing with Brian Culbertson, with Peabo Bryson. An awards ceremony for, among other categories, "Wine Industry Person of the Year," adds to the fun. In a career spanning nearly two decades, Dave Koz has established himself as a platinum-selling artist. In 2007, he released two chart-topping collections of standards. At The Movies, his lush, romantic celebration of timeless melodies from cinema, spent eight weeks atop Billboard’s Top Contemporary Jazz chart and was nominated for a Grammy in the “Best Pop Instrumental Album” category. It features special guest performances by India Arie, Anita Baker, Chris Botti, Barry Manilow, Johnny Mathis, Donna Summer, and Vanessa Williams. Brian Culbertson is a keyboardist, trombonist, writer, arranger, producer and one of the most exciting live performing instrumentalist on the scene today. Culbertson has worked with some of the greatest names in funk, including Maceo Parker & Fred Wesley (from James Brown's JB’s band), William "Bootsy" Collins and Phelps "Catfish" Collins plus members of the Rubber Band and the Horny Horns (all out of Parliament-Funkadelic), Larry Graham (of Sly & The Family Stone and his own Graham Central Station), Larry Dunn and Sheldon Reynolds (of Earth Wind & Fire), Greg Adams (from Tower of Power), and Tony Maiden and Bobby Watson (of Rufus). Click here to go directly to the ticket page for An Evening of Music & Wine. Enter to win a pair of tickets to this year's An Evening of Music & Wine at SloCountyWineries.com. The deadline to enter is July 20, and the random drawing will take place on July 21, the day before the Fair begins! For more details, and to enter to win, stop by the front page of SloCountyWineries.com. Good luck!